Bell Bridge Books. 348 pages. $18.00. 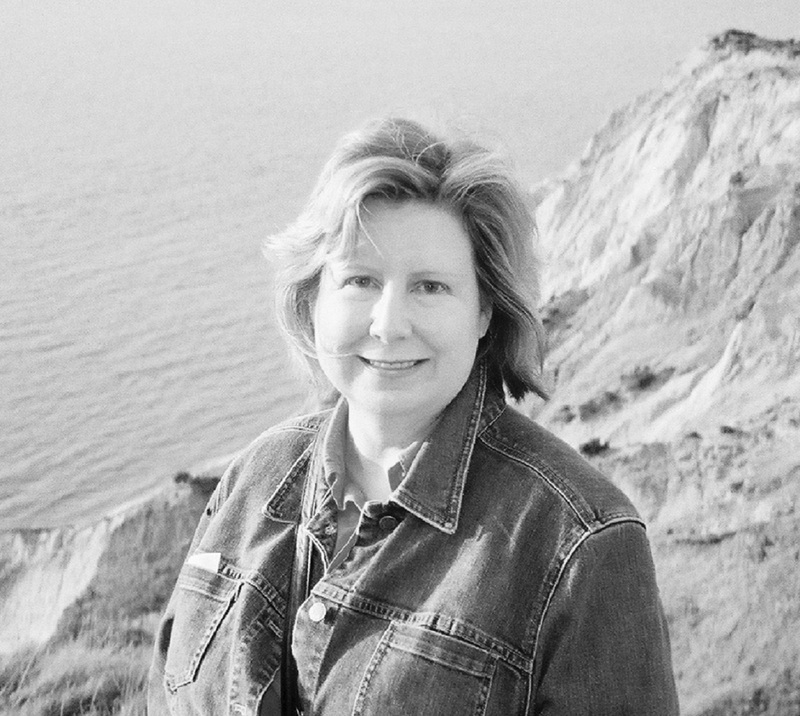 An independent woman; a lush frontier environment; the approach of war; and a romance of opposites are only some of the ingredients in Ms. Crawford’s ambitious first novel. Combining a style that is frequently lyrical, abundant historical research that has been well-absorbed and woven into the fiction with authority, and an immensely likeable – irresistibly headstrong – protagonist, the author should attract a good many readers. Keowee Valley spills over the boundaries of conventional historical romance with its enormous richness and haunting evocations of spiritual vision. It is 1768 in the bustling port city of Charlestown anchoring the British colony of South Carolina. 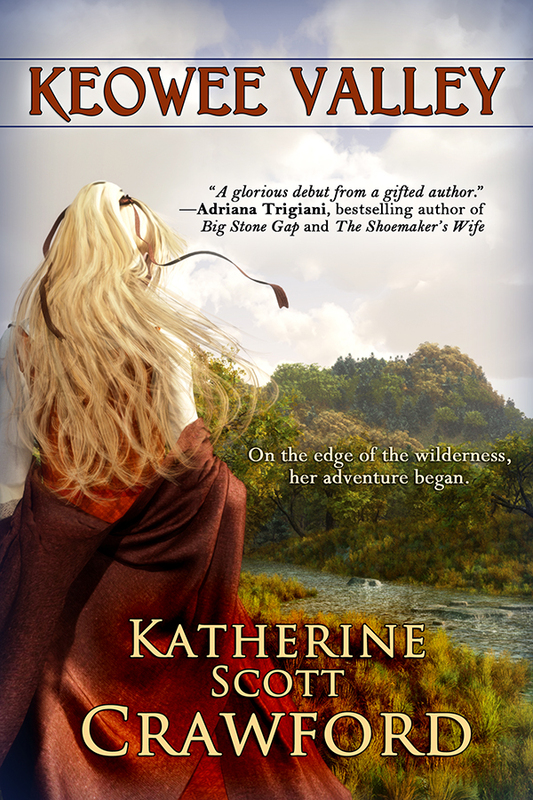 25 year old Quincy MacFadden, the ward of her Scottish grandfather Campbell, cannot resist the opportunity to help bring back her cousin Owen Scott (also Campbell’s grandchild), who has been captured by the Shawnee. In the process, she hopes to explore the back country and find suitable acreage to invest her dowry (which is not attached to the string of marriage). 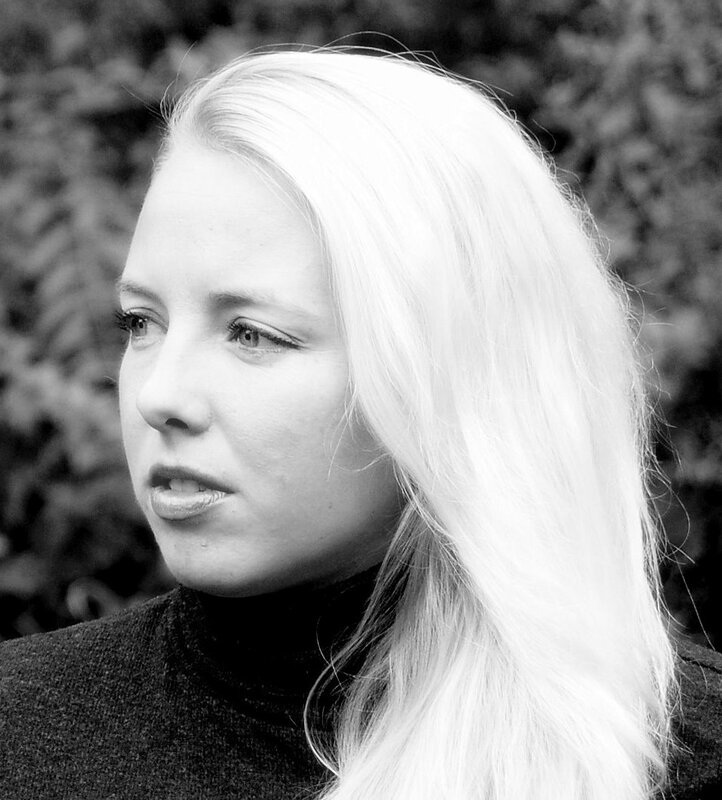 She hopes to live a life of her own design, independent of the strictures of convention. As much as Quincy loves her grandfather and Charlestown, she finds no further possibilities for self-discovery in his home or in that town. Though she has led a pampered existence, Quinn (as she prefers to be called) believes she has the stuff to venture out beyond the conveniences she has known. Reluctantly, and with a few conditions thrown in, her grandfather assents. It’s not as if she is a child. Her dual goals lead her into the astonishingly beautiful Appalachian region of the Carolinas, where settlers are few and colonial British outposts are thinly scattered. This realm is also the heart of the Cherokee Nation. As Quinn and her party make their way, Ms. Crawford slowly builds the growing political tension as a growing number of colonists find the British government’s policies more and more repressive. An explosion is not far off. Also, the relationships between colonists, government officials and various Indian tribes are always in danger of falling into chaos and bloodshed. Nonetheless, Quinn makes her arrangement for a huge tract of land in a gorgeous setting and goes about building a community by selling off homesteads or trading for labor and expertise. She seeks to build cooperative enterprise. Various families make their way to this new opportunity for new lives, and the community takes hold. . . .
Death in Four Courses, by Lucy Burdette. Signet Obsidian. 320 pages. $7.99. The second title in Ms. Burdette’s Key West Food Critic mysteries builds firmly and sure-handedly on the first, An Appetite for Murder, published (and reviewed in these pages) early this year. As readers will expect, murder will find budding food critic Hayley Snow as she tries to solidify her job writing restaurant reviews for a life style magazine named “Key Zest.” This time, two murders find her and her visiting mother disappears. 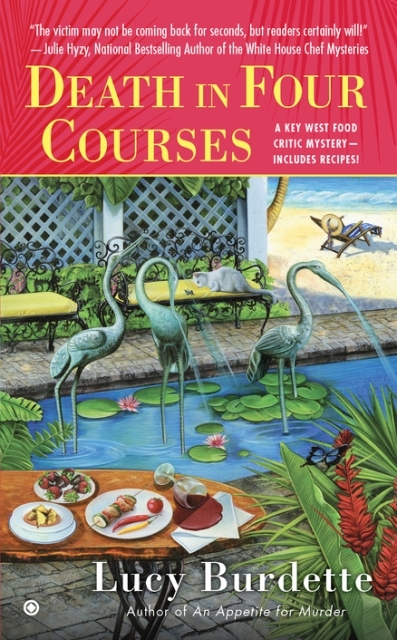 Taking advantage of Key West’s popularity as a setting for writers’ conferences, Lucy Burdette imagines a special conference for food writers. Hayley, of course, is excited about covering this important event for the magazine. She can rub elbows with some of the movers and shakers in the field while enjoying and writing about the special dining treats that are part of the conference. When the keynote speaker, tell-all food guru Jonah Barrows, is murdered, Hayley can’t help but look into the case, especially when her good friend Eric becomes the primary suspect. Of course one’s close friends are never murderers. Especially when she’s the one who found Barrows lifeless in a decorative pool. Hayley’s meddling behavior, assisted nobly by her energetic and perceptive mother, does not improve her tenuous relationship with the heartthrob detective, Nate Bransford, who leads the investigation. Well, murder gossip is exciting, but it throws a cold blanket on the conference. Dustin Fredericks, the organizer and host of the affair, has a big problem breathing life back into the event and keeping it on track. His problem grows even larger when another of the featured speakers is found dead. 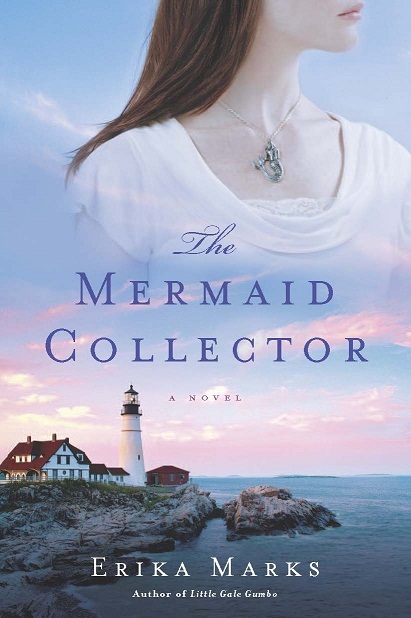 While looking for the conference’s missing Chinese food specialist, Yoshe King, Hayley and mom come upon her lifeless body on a pile of waterfront rocks just below the balcony of her bed-and-breakfast room. Is it suicide –or foul play? Does Yoshe’s death have anything to do with Jonah’s? Mother and daughter push on . . . and on, until the resolution of both mysteries. The springs of suspense are wound tighter and tighter as the novel progresses. Clearing Eric of suspicion would seem to demand the determined action of this dynamic duo. . . .
TALLAHASSEE, Fla. — The Florida Book Awards has kicked off its seventh annual competition with a call for entries in nine categories. The contest categories include General Fiction, Young Adult Literature, Children’s Literature, Florida Nonfiction, Poetry, Popular Fiction, Visual Arts, Spanish Language Book, and a new category for General Nonfiction. Entries, which can be submitted by anyone (e.g. publisher, author or literary agent), must have both an original publication date between Jan. 1, 2012, and Dec. 31, 2012, and an International Standard Book Number (ISBN). Applicants are encouraged to submit their books into competition any time after the competition is launched, and as soon as possible after books are officially published. All entries must be received no later than 5 p.m. Thursday, Dec. 1, 2012 (this is not a postmark deadline). Three-person juries –– including members of co-sponsoring organizations, subject experts from the faculties of Florida colleges and universities, and previous Florida Book Award winners –– will choose up to three finalists in each of nine categories. In each category, the jury may award one Gold, Silver and Bronze medal. The Florida Book Awards competition is coordinated through the Florida State University Libraries, with the support of book lovers from across the state. New co-directors Andrew Frank and Lisa Tendrich Frank are enthusiastic about their involvement with the Florida Book Awards. The 2012 winners will be announced in early February. Gold Medal Award winners will be acknowledged in March 2013 at the Historic and Cultural Awards Ceremony sponsored by the state of Florida’s Division of Cultural Affairs. In addition, all Florida Book Awards medalists will be recognized at a banquet hosted by the Florida Library Association at its annual conference. Winning books and their authors will be showcased in the summer issue of FORUM, the statewide magazine of the Florida Humanities Council, and will be featured at book festivals and association conferences and on The Florida Channel throughout the year. In addition, copies of all award-winning books will be put on permanent public displays, one in the Governor’s Mansion Library and one in Florida State University’s Strozier Library. For general information and the entry form, requirements, and more detailed instructions for the 2012 Florida Book Awards, visit http://floridabookawards.lib.fsu.edu. 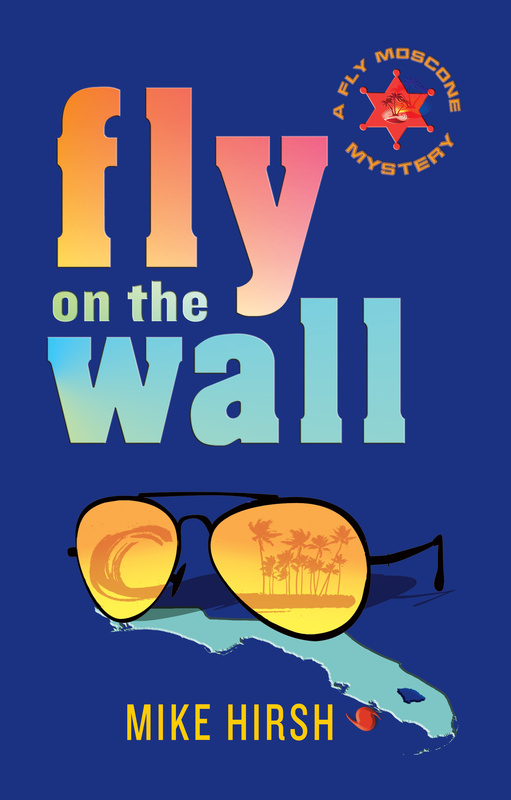 Fly on the Wall, by Mike Hirsh. Antenna Books. 298 pages. $14.99. Kindle ebook $5.99. In the aftermath of Hurricane Charley, human nature rears its ugly head. The vulnerable citizens of Punta Gorda, on Florida’s southwest coast, work their way through the chaos and destruction of the storm only to be preyed upon by their fellow man. There is a murder to solve, insurance fraud to uncover, and a sense of community to restore. As they look back on it, wise-cracking Paul “Fly” Moscone, retired North Jersey computer salesman and now volunteer deputy in the county sheriff’s office, and his friend Bill “Jinx” Shiffman, a former journalist from L.A., banter and bicker through a beautiful day on Fly’s yacht with new friends who form a captive audience. The telling of the tale is colored by wit and humor as Mike Hirsh, through his keen sense of place, suspenseful dual narration, and riotous characterizations, gets it done. Though Fly and Jinx are good friends and almost inseparable, their relationship depends on trading insults nonstop. Much of the verbal humor in this novel depends on this “ballbusting” competition. As the take turns driving Fly’s boat and telling their story of the hurricane, they delight in challenging one another’s manhood. Readers will discover the deep respect that lies under the spirited digs and jibes. Fly is the central figure. He is the one who comes across two potential crimes in the aftermath of Charley. Responding to a complaint that blood is leaking through a condo-dweller’s ceiling, he climbs up to the penthouse above and finds that the owner had bled out after being wounded by a shard of glass. Was this fatal injury from the storm? Fly see signs of foul play and thinks murder is a possibility. A bit later on, Fly discovers that something else is fishy in that luxury condo: a very valuable Picasso drawing that should be there is missing. He knows where it is and rather easily discovers the culprit, but the outcome of his investigation is still quite surprising and reveals unexpected aspects of Fly’s character. Meanwhile, insurance fraud is rampant. Fly, representing the sheriff’s office, accompanies a shrewd investigator on a few cases. He learns a lot from this man, Vin, and the reader learns a lot about the way the insurance industry handles suspect disaster claims. Fly is enraged at how people who are otherwise law-abiding citizens can have no qualms about attempting to rip off an insurance company. 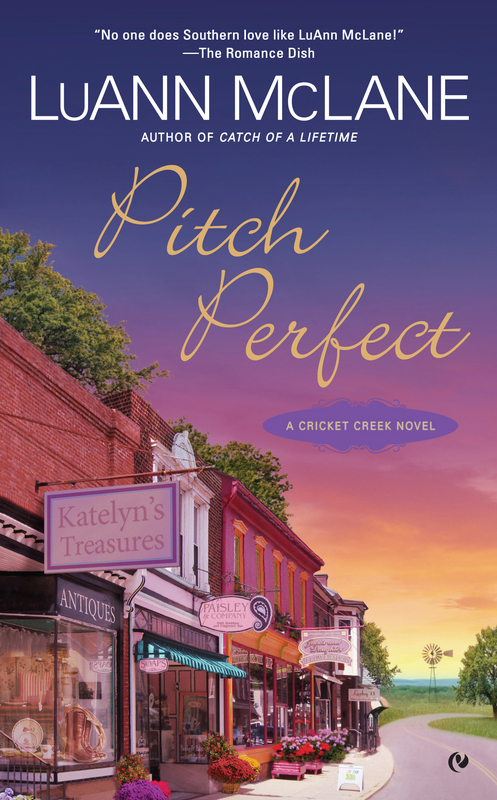 It’s amazing how they will lie and lie, even as all the evidence exposes their deceit. . . .
LuAnn McLane’s latest novel, Pitch Perfect, continues the celebration of a small Southern town that is at the heart of her “Cricket Creek” series. This Kentucky community is a place where people are genuinely friendly, hospitable to strangers, and unusually optimistic. The people who live there are very much aware of their good fortune, and the spirit of the place is an attraction to others. Though Cricket Creek, like countless American communities, had fallen on economic hard times, it has been finding its way back. Cricket Creek is where Mia Monroe’s clunker car gives out one day, as she travels from Chicago to some unknown destination: this is a young woman in search of herself. Raised in luxury by a somewhat distant father who has made himself into a highly successful businessman, Mia has felt estranged from him, in part because he has never given her the face time that she has needs, but particularly because she believes he has taken advantage of an old friend’s business difficulties. In her mid-twenties, Mia is not really grown up. She has been handed a life that has sheltered her from reality and led her to take her material good fortune for granted. Because little has been expected of her, she has not had the opportunities to take chances and learn from her mistakes. She hasn’t really ever held down a job. She knows almost nothing about adult responsibilities. The good thing is that she recognizes these shortcomings. Breaking away from her father is a blessing in disguise as it leads her to understand what independence means. It’s also a blessing in that it leads her to Cricket Creek. She needs to prove herself, and here people are willing to give her a chance. With no resumé but her personal charm and openness, Mia is offered a job waitressing – one that comes with a place to stay. The man who runs the car repair business treats her with sympathy and respect. For a long while, Mia continues to believe that Cricket Creek is a place she is just passing through, but that perspective slowly changes. Well, this is a romance novel after all and right from the beginning Mia runs into a dazzling hunk named Cameron, a struggling less-than-minor-league baseball player whose dirt-poor beginnings lead him to mistrust and shun the wealthy. Cam has been offered his last chance to get back to the minors and then perhaps to the majors if he can keep out of trouble. His “wild ways” have been a problem so far. The Cricket Creek Cougars are his last hope. In trying to make it on her own, Mia has hidden her true family name. Given Cam’s prejudices against the rich, hiding her background becomes even more important as their guarded romance heats up. Suspense builds as readers hope for a sturdy relationship taking hold before the truth comes out and blows everything to pieces. . . .
During the weekend of September 7-9, the 12th annual meeting and trade show of the Southern Independent Booksellers Association took place in Naples, Florida at the Waldorf Astoria. The weekend was filled with meetings, major addresses, break-out sessions, socializing, and the trade show itself. It was preceded on September 6 by a special event on Marco Island run by Sunshine Booksellers, the only independent bookseller in Collier County. On Friday, the program was filled with fascinating sessions, usually 3 or 4 at a time. Attendees had to choose carefully. It began with the Industry Breakfast, hosted by Hunter H. Hansen, the Waldorf Astoria’s Area Managing Director. Talks and informal conversation focused on general business issues: building relationships, planning special events for one’s business, being part of the community, and staff education. At 8:30am, the annual SIBA board meeting did the usual business of introducing the new board members, thanking the continuing and outgoing ones, and offering a state of the organization along with news about new initiatives of SIBA and the nationwide ABA (American Booksellers Association). The theme was one of modest growth of the independent bookselling industry in the face of the general malaise of the overall book industry (publishing in particular). I chose to attend the 9:45am breakout session called “What’s Working?” that shared information about enhancing management of daily bookstore operations. The speakers, all bookstore owners, were Suzanne Harouff (Books Unlimited in Franklin, NC), Karin Wilson (Page and Palette in Fairhope, AL), and Doug Robinson. They presented information on effective techniques for generating bookstore traffic, ordering, invoicing, and recordkeeping. Doug demonstrated his security cameras at work, offering a live broadcast from those very cameras in is Eagle Eye Book Shop in Decatur, Georgia. He noted how revealed traffic patterns provided suggestions for making adjustments in bookstore layout. The 11-11:50am sessions were all author panels. One featured authors of children’s books, another introduced writers of books of mystery and magic, and yet another – which I attended – showcased authors who had also been booksellers. Most impressive here was the presentation by Maureen Lee, who spoke about her biography of African-American soprano Sissieretta Jones. The booksellers in the audience no doubt most enjoyed knowing about Wendy Welch’s The Little Bookstore of Big Stone Gap. Other presenters at this session were Peter Golden and Cliff Graubert. The noon luncheon included additional author presentations, followed at 2:00pm by a “Meet and Greet” where attendees could pick up signed copies of books by author panel participants. Five breakout sessions were offered at 3:00pm. Two continued with the business of ordering and invoicing; another showed how print-on-demand could be an asset to the independent bookseller as it allowed for exclusive product offerings. “Hear from the Agent-See Model.” A panel of literary agents drew parallels between their work and that of the independent bookseller. I attended the groundbreaking session “ABA Presents New ebook Options for Indie Bookstores.” ABA (American Booksellers Association) CEO Oren Teicher provided details about a new initiative, launched at this event, that would allow independent booksellers to engage in ebook selling through an arrangement with Kobo – the ebook digital reader and content provider, and Ingram, the distributor. This is a well thought out program that allows booksellers, at little risk, to hold onto those customers who are moving in the ebook direction. At the 4:10pm “Saints and Swimmers and Sinners” author panel, I encountered Erika Marks (whom I met again on Saturday at the Trade Show), Lisa Alther, Adam English, and AGS Johnson, who moderated. There were also panels on writing for kids and teens, and young adults (if there’s a difference between the latter two categories). “Reps Picks,” at 5pm, brought a roomful of pick titles lauded by publishers’ representatives. That evening included partying, networking, a supper with big-name authors (like Randy Wayne White and Jill McCorkle), and a “Ladies of the Late Night Readings” session featuring six authors. Then it was Saturday! A breakfast sponsored by Harper Collins, a technology pavilion, a Jericho Press presentation, and the main course: the Trade Show exhibits. Here I filled up on books I’m likely to review; in particular, Florida authors and books on Jewish and Southern themes. In the early evening, participants enjoyed “The Writers Block Party,” with games and competitions. Prizes were dinners with SIBA Book Award Authors. Sunday: another breakfast, more exhibiting, more technology, and the early afternoon “Moveable Feast of Authors.” Robert Olen Butler and a couple of dozen other authors of some prominence were on hand. I got to sit down at the close of the conference with Amy Hill Hearth, whose latest book I will be reviewing: Miss Dreamsville and the Collier County Women’s Literary Society. This is a sure-fire bestseller. 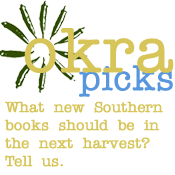 SIBA is an extremely lively and effective organization. Its member booksellers are motivated and inventive. I only hope more book journalists take advantage of the opportunities SIBA presents to find materials for their articles and reviews. 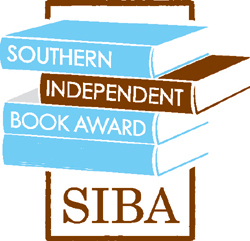 I came away from the weekend with one question: How can Southernlitreview.com collaborate with SIBA for the benefit of authors, publishers, booksellers, and readers? We’ll see. 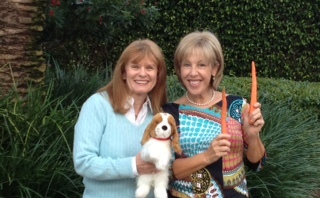 “Carrots for Charlie,” by Rhonda Brazina and Ida R.Margolis. Illustrated by Virginia C. Mulford. Barringer Publishing. 40 pages. $9.95. 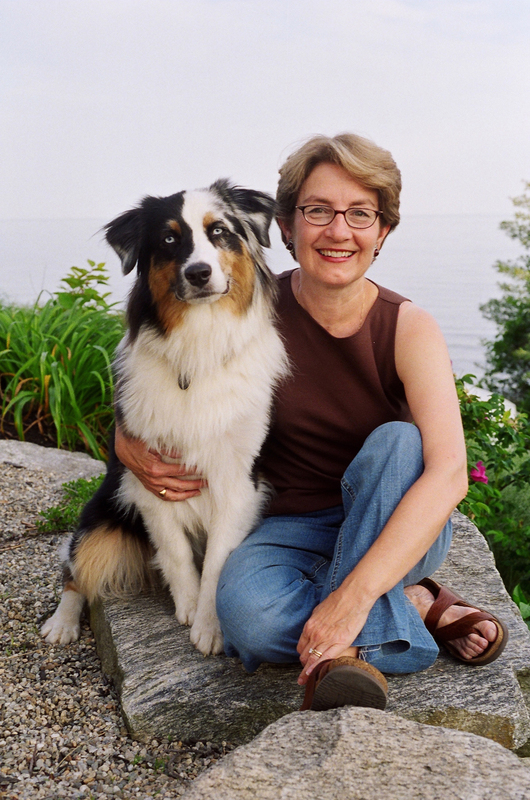 Authors Rhonda Brazina and Ida R. Margolis are educators who are now based in Naples. Like many parents, grandparents, teachers, and healthcare professions, they have become concerned about the growing health crisis among children. Far too many youngsters seem to be trapped in lifestyles that are deficient in exercise and nutrition. However, it’s not an exciting topic, and lectures alone don’t do the job. Parents and others who care need help in adjusting perceptions and behavior. “Carrots for Charlie” means to get the message across to children in a playful, engaging way. 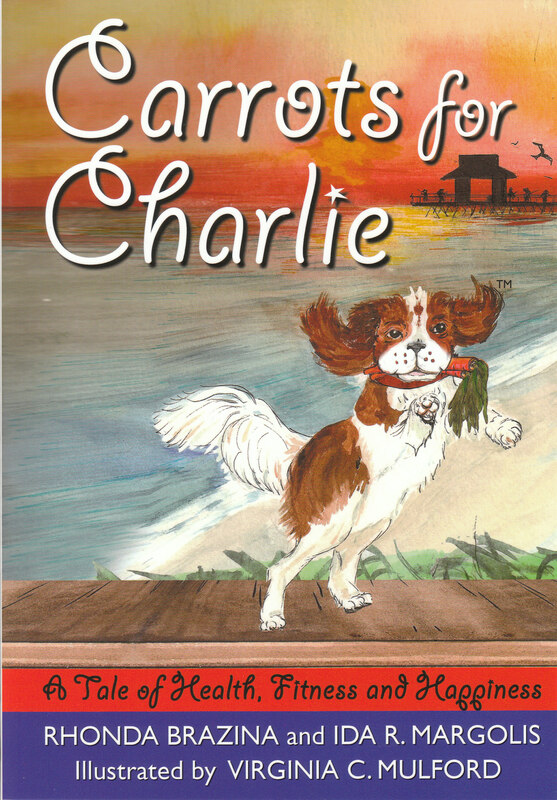 While the book focuses on a dog named Charlie, the authors clearly intend for young readers and listeners to understand that Charlie’s problem is theirs. And guess what? Pets have dietary and exercise needs too. As the book opens, we meet a young man named Max who has decided to adopt a pet from the local shelter. Max has always made a habit of walking along the Naples beaches and elsewhere. He loves to be outdoors, and he loves to make up and sing songs. Now he has Charlie to accompany him, and Charlie has a ready-made routine that helps to keep him fit. The spaniel enjoys listening to Max sing. Max’s songs provide youngsters with rhymed packets of information and inspiration. They connect fitness not only with physical well-being but also with the accompanying uplift of mood and attitude. The message: things that are good for you are not difficult and can be fun. When Max begins giving singing lessons about town, he leaves Charlie behind with the television on and too many unhealthy treats. Before long, Charlie is overweight and sluggish. The neighborhood kids notice this problem, and the alert Max to it. Soon enough, sweet treats are out and nutritious vegetables and fruits are in. Max learns to disguise the carrots Charlie doesn’t like by flavoring them with healthy yogurt. Charlie’s exercise becomes enhanced when Max takes him to a fitness center designed for dogs and their owners. It’s hard to say whether the authors have limited the scope of their message by making Naples, Florida the setting and by being so specific about local places: our dog parks, dog friendly places, the Naples Zoo, and so forth. Perhaps the idea is that such places are everywhere, if one takes the time to look. So are farmer’s markets where fresh vegetables are plentiful. In any case, this book has a special hook for Neapolitans in love with their community. The impact of “Carrots for Charlie” is enhanced immeasurably by Virginia C. Mulford’s illustrations. They set just the right friendly and lively tone, while creating attractive settings for the action. There are several special features that add to the book’s utility. The authors provide a question page that encourages young readers to think back over what they’ve read. A direct address to parents, guardians, and teachers offers additional information about children’s and pets’ fitness issues. Useful resources, including websites, are provided. Perhaps best of all, the book includes a small sampling of simple, healthy recipes. “The New New Deal,” by Michael Grunwald. Simon & Schuster. 528 pages. $28.00. 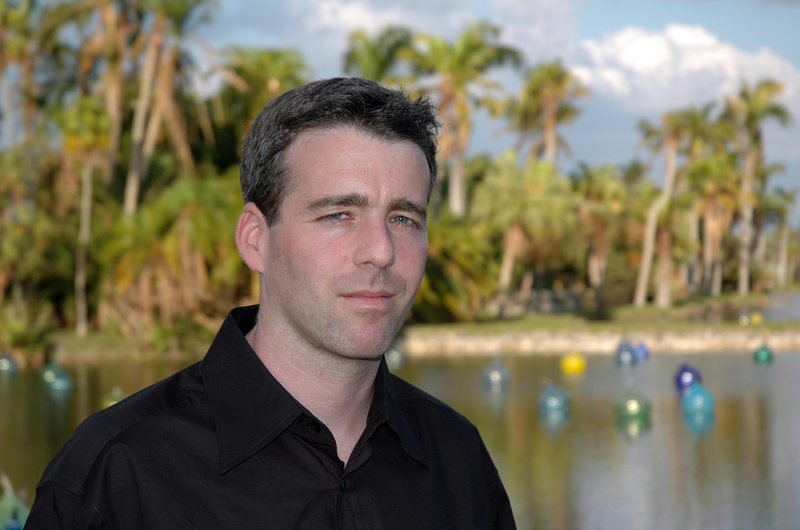 Award-winning investigative reporter Michael Grunwald first came to the attention of many Floridians with his highly acclaimed “The Swamp: The Everglades, Florida, and the Politics of Paradise” (2006). This highly acclaimed volume demonstrated Mr. Grunwald’s ability to organize what would seem to be an unwieldy amount of complex research into a vivid, coherent, and intellectually stimulating narrative. It has been a game-changer in the world of ideas. Even more so will be his new book about “The Hidden Story of Change in the Obama Era.” While convincingly countering prevailing notions of the Obama administration’s accomplishments, “The New New Deal” manages to be just plain fascinating reading. In the face of his opponents’ drumbeat attacks belittling the outcome of Obama’s campaign message of hope and change, President Obama, as Mr. Grunwald tells it, has made good on a wide array of promises. A surprising measure of change has already occurred, much of it underneath the radar of the daily news cycle and public awareness. While it is astounding how many Obama initiatives have been stifled by Conservative Republican legislative blockades, it is equally astounding how much has been put into place. Underneath the hubbub and exchanges of insults, the game has changed. Michael Grunwald frames his discussion of the early years of Obama’s presidency by analyzing several interrelated factors. First of all, the magnitude of the U. S. economic crisis was severely underestimated. Secondly, the Republicans were committed to regain control of the government at just about any cost. Thirdly, the Recovery Act and its underappreciated “Stimulus” projects, put into place while Obama governed with a legislative majority, have suffered enormous losses in the battle for respect from the general public. Yet they have halted a likely fall into a severe depression and initiated much of the forward-looking goals announced in the campaign agenda. As Mr. Grunwald points out, there have been stumbles along the way. Some projects and investments failed to pay off. And certainly the selling of the Recovery and Stimulus package was far from effective, especially since the media has focused on high-profile failures. However, if one measures stated goals against what’s been put into place, the country has been undergoing a stealth revolution that holds great promise for the future if its legs are not amputated in the coming election cycle. In clean energy, there have already been significant strides with many government-aided private ventures taking hold – and creating new jobs in the process. The renovation of the fragile energy grid is underway, along with other energy supply enhancements. Important reforms in education – reforms to prepare the United States for a healthy position in the competitive world marketplace for ideas and products – are underway. The push for building a network of electronic medical information is already improving medical care while introducing cost-saving. time-saving, and error-avoiding benefits. . . .